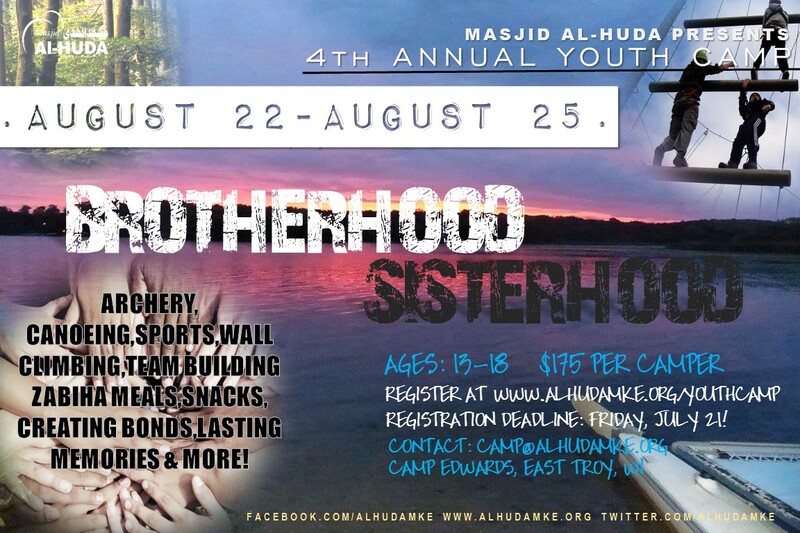 ABOUT: The Fourth Annual Masjid Al-Huda Youth camp will be for youth(brothers and sisters) between the ages of 13-18. Brothers and sisters ages 13 to 18 will be in separate accommodations in the same campsite under the supervision of adult male and female camp counselors, respectively. GOAL: To provide youth with an opportunity to spend time building brotherhood/sisterhood while enjoying recreational activities and also learning about the deen to strengthen their imaan. *Note: Brothers and Sisters will take part in the exact same activities but at different times. DATES: Tuesday, August 22, 2017 to Friday, August 25, 2017. * Masjid Al-Huda will provide zabihah/hand slaughtered meat to Camp Edwards staff.